Game Transfer Phenomena overview. University of Bergen. Open house 2017. The Midlands Hub Regional Poster Competition 2011. Selected for regional competition, UK. Postgraduate Spring Conference 2012, Nottingham Trent University, UK. Ortiz de Gortari, A.B (September, 2018). Can sensory intrusions and motoric activations caused by the use of technology become pathological? 18TH World Congress of Psychiatry. Mexico D.F, Mexico. Ortiz de Gortari AB. (October, 2017). High incidence of sensory and cognitive intrusions with videogame content: Underlying psychopathological factors. International Consortium Conference and Meeting, Lille, France. 17th Annual CyberPsychology & Cyber Therapy Conference, Brussels, Belgium. 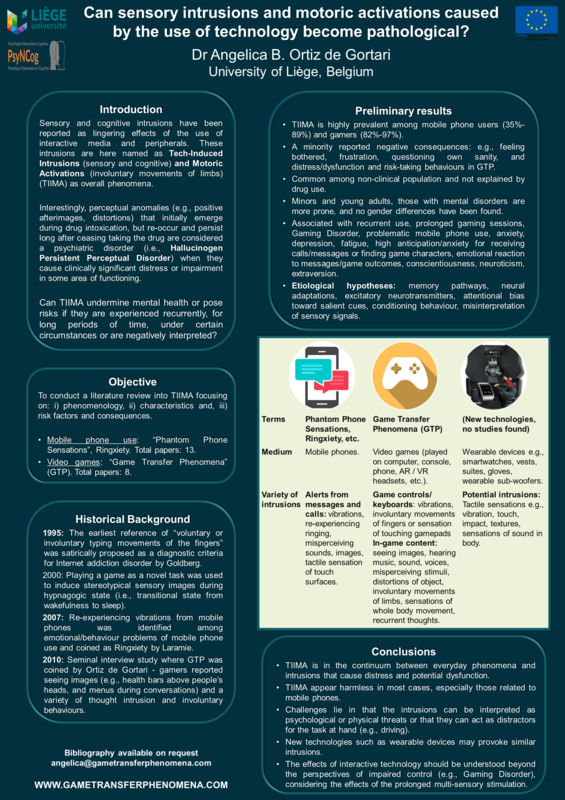 Interactive Technologies and Games – Education, Health and Disability. (2014). Nottingham Trent Univeristy. Nottingham.